Search For "E-Commerce & IT Outsourcing" Companies in Des Moines, Iowa - Click Here Now! Work At Home Jobs, Home Business And Small Business Information. 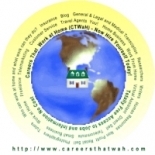 Rss Feeds, Live Media For Job Finding Or Business Finding. Many Related Catergories. World Wide Opportunities. Totally Free Access To All Parts Of The Website. Careers That Work At Home CTWaH in Des Moines is a company that specializes in Computer Related Services, Nec. Our records show it was established in Iowa.